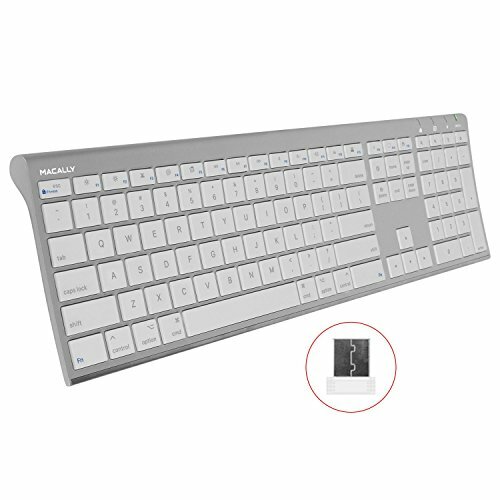 The Macally RFACEKEYA is an 2.4ghz wireless keyboard with a standard layout that 110 full size, yet thin, keys for a comfortable and efficient typing experience. The 20 convenient shortcut keys and numeric keyboard further increase efficiency and productivity. Plugged-in or traveling, you have the option to be wireless and never worry about charging the built-in rechargeable battery for 3 months (based on the average use of 3 hours per day). Simply plug the USB dongle into a USB-A port of your computer and you are ready to go! No software is required! And with the elimination of cables, you can reach your synced device anywhere in the room. At Macally, we believe in our products. That's why we back all of our product with a one-year warranty, 30 days hassle free return, and provide friendly, easy-to-reach customer support. ULTRA THIN MAC WIRELESS KEYBOARD: Constructed with aluminum backing, the external slim keyboard's height is less than that of a penny. If you have any questions about this product by Macally, contact us by completing and submitting the form below. If you are looking for a specif part number, please include it with your message.